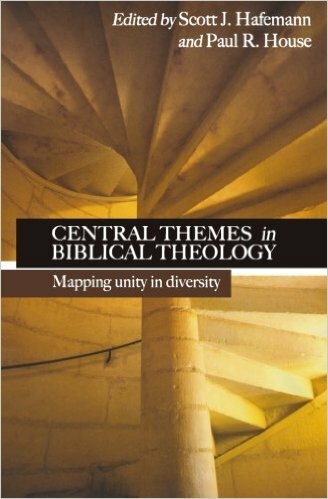 In Central Themes in Biblical Theology: Mapping Unity in Diversity the authors pursue ‘whole-Bible biblical theology’ across seven themes; that is, they believe the Bible is comprehensive and provides a consistent unified message in all its diversity. The seven themes chosen for this book are not deemed the most important, but are “a solid sample of key biblical ideas” (p16) nonetheless. In most chapters, the author traces his theme across the entire Biblical canon. For example, Theilman’s treatment of the atonement is divided into sections on the Old Testament, Pauline tradition, Petrine tradition (including the Gospel of Mark), Johannine tradition, and then Hebrews and Revelation. Paul House’s chapter on the Day of the Lord has sections on the Law, the Prohpets, the Writings, the Gospels, Paul’s Letters, and 1-2 Peter; with individual books discussed within their respective sections. The exception to this pattern is found in the final two chapters, which have a more thematic structure; however, even here, the development of the theme across the canon is traced. Without disparaging the other chapters, I will discuss a few samples below. Hafemann’s chapter on covenant was comprehensive in scope and helpful, especially in showing the importance of covenant for Paul; however, I was disappointed that the Davidic covenant was virtually ignored in his treatment, and was not convinced by his packaging of covenants together, such as subsuming the Abrahamic and Mosaic covenants together under the “old covenant” (e.g. p29). I don’t think we have Scriptural warrant for conceiving of the covenants this way and Niehaus has rightfully and convincingly argued against “theologically constructed covenants” (PDF), within which the individual Biblical covenants belong. Schreiner, always clear, provides a sweeping overview of God’s commands in Scripture, concluding with seven digestible points. First, sinners are unable to faithfully keep God’s law. Second, covenant demands are not the basis for relationship, but the response to God’s redeeming work. Third, the New covenant is “superior” (p100) to the Old (Mosaic), as all members of the new covenant are forgiven and empowered by God to obey. Fourth, obedience and faith “may be distinguished, but should not be segregated from one another” (p101). Fifth, the Spirit empowers our obedience; both to will and to do. Sixth, the Mosaic covenant was temporary and is terminated with the coming of Christ. Seventh, while believers are not under the Old Covenant law, they are under the “Law of Christ”, which is built upon the teaching of Christ and His apostles and fulfills the intention of the law through love. Ciampa’s chapter is distinctive, examining different models for understanding God’s plan of redemption from 1,000 feet up and providing helpful charts for illustrating these approaches. Though published in 2007, Central Themes in Biblical Theology is a valuable resource for those wanting to grasp a wide-view lens of Biblical teaching due to a stellar lineup discussing key Biblical themes. Even those who disagree with some of the specifics – perhaps Hafemann on covenant or Schreiner on Old Covenant Law – all can benefit from the examples of good whole-bible theology found here. Mann thanks to IVP UK for kindly providing a review copy.